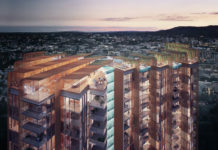 The creator of the Emporium Hotel – Anthony John Group – will launch the first stage of its highly anticipated $590 million Southpoint development to the public in August. 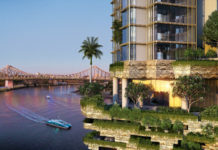 South Bank’s last remaining development site – located on Grey Street, between Vulture and Tribune Streets – will soon be one of the largest mixed-use, transport-oriented development (TOD) projects in Queensland and home to Brisbane’s second five-star Emporium Hotel. Southpoint will also feature 42,000sqm of A-Grade commercial office space and 221 one, two and three bedroom luxury apartments. The first stage of the development will comprise a 21-level building with the residential apartments and 146-room hotel. Anthony John Group Managing Director Tony John said release of the first Southpoint apartments was a significant milestone. “We have worked hard to deliver a unique design that integrates our residential offerings in the same building as the Emporium Hotel,” he said. “This means that while residents will still enjoy private entry and lifts, they can also take advantage of the hotel’s five-star facilities and services, including 24/7 room service, valet parking, concierge and access to restaurants and bars. The residential and hotel building, located on the corner of Grey and Tribune Streets, will be linked by a ground-level pedestrian plaza that will incorporate convenience shopping, wine bars, cafes and South Bank train station. Chief Executive Officer Shane Bulloch said that as the last piece of South Bank, Southpoint would reinforce the precinct as a premium place to live and work. “Southpoint’s unique design seamlessly integrates office, retail, residential and hotel uses with the public transport hub creating a safe, vibrant and exciting place that confirms South Bank as Brisbane’s leading master-planned, mixed-use community,” he said. The Stage One residential release will comprise 60 one-bedroom, 65 two-bedroom and five three bedroom apartments, ranging in price from $375,000 to $1,690,000. Mr John said early sales interest had been strong and that he expected this would increase with the August opening of Southpoint’s sales office – a striking building inspired by the 2012 London Olympics Basketball Arena. “Our bold sales office represents our vision for Southpoint: stunning, vibrant, innovative and sustainable,” he said. Southpoint apartments will feature large living and dining areas with picturesque views enjoyed through floor-to-ceiling glass. Southpoint’s state-of-the-art kitchens will include European stainlesssteel appliances, integrated fridges, reconstituted stone benchtops and smart storage options. Construction of the residential apartments is scheduled for completion in the first half of 2016, with the new Emporium Hotel to open around the same time. Where can I see the display ?